Fernando Alonso's "frustrations" at McLaren might be a reason the double world champion is hinting at retirement, says former team-mate Nelson Piquet Jr.
Alonso, 33, has yet to score a point on his return to McLaren, nor has the team scored points in the first four races. And the Spaniard recently said "he was looking at other things", and thinking about "different priorities in life". "It's frustrating - you're the best but driving ninth, 10th," said Piquet Jr.
"I'd understand if he wants to retire. I wouldn't discount him doing that for a year or two, then returning." Alonso, who signed a three-year contract with the British team after leaving Ferrari, has managed a 12th and 11th placing so far this season - though both the driver and McLaren say they are confident there will be an improvement in the next race, the Spanish Grand Prix on 10 May. 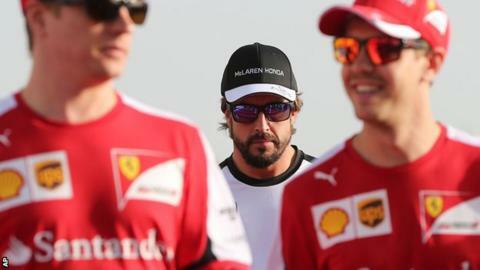 However, there have been suggestions the relationship between Alonso and the team has already become strained. The Spaniard blamed the steering for a crash in pre-season testing that left him in hospital for three days, and resulted in him missing the opening race in Australia. McLaren denied there was a problem. "He was thinking moving back to McLaren would be very good, and the salary must have been part of the reason. For some reason they are not doing well," added Piquet Jr, now competing in Formula E, having raced with Alonso at Renault in 2008 and 2009. "He's paid a lot of money to do what he does best and he wants to deliver. But when there are no means to do it you will have a very frustrated person." Alonso returned for a second spell at McLaren after five years with Ferrari, where he failed to land a third Formula 1 drivers' title. The Italian team finished fourth in the constructors' championship in 2014, but seem more competitive this season and sit second behind Mercedes. "Fernando is the best driver out there," said Piquet Jr, son of Brazilian three-time F1 world champion Nelson Piquet. Referring to Lewis Hamilton winning his first title with McLaren in 2008 after Alonso left for Renault, he added: "I think it gets a bit annoying when it's the second time he's changed a team, and the team he has left has done well. "It's not his fault. It's the wrong time at the wrong place. That happens."